For over thirty years, Stephen Braude has studied the paranormal in everyday life, from extrasensory perception and psychokinesis to mediumship and materialization. The Gold Leaf Lady and Other Parapsychological Investigations is a highly readable and often amusing account of his most memorable encounters with such phenomena. Here Braude recounts in fascinating detail five particular cases—some that challenge our most fundamental scientific beliefs and others that expose our own credulousness. Braude begins with a south Florida woman who can make thin gold-colored foil appear spontaneously on her skin. He then travels to New York and California to test psychokinetic superstars—and frauds—like Joe Nuzum, who claim to move objects using only their minds. Along the way, Braude also investigates the startling allegations of K.R., a policeman in Annapolis who believes he can transfer images from photographs onto other objects—including his own body—and Ted Serios, a deceased Chicago elevator operator who could make a variety of different images appear on Polaroid film. Ultimately, Braude considers his wife’s surprisingly fruitful experiments with astrology, which she has used to guide professional soccer teams to the top of their leagues, as well as his own personal experiences with synchronicity—a phenomenon, he argues, that may need to be explained in terms of a refined, extensive, and dramatic form of psychokinesis. 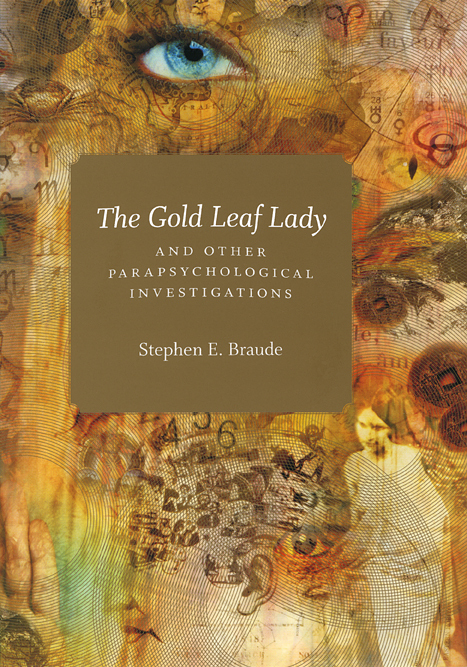 Heady, provocative, and brimming with eye-opening details and suggestions, The Gold Leaf Lady and Other Parapsychological Investigations will intrigue both adherents and detractors of its controversial subject matter alike. 5 · K. R., or Who Can You Trust? "Stephen Braude’s Gold Leaf Lady is by turns funny, serious, sad, and mischievous. Whether you’re a believer or not, you read his book hoping that it’s all true." "This book is an easy read, provides some fairly strong evidence for the existence of paranormal phenomena and I’m sure will entertain most readers—other than [the author’s] professional colleagues." "I enjoyed the book for its fascinating anecdotes and discussion of issues that they raise. . . . It can certainly be recommended . . . to anyone thinking about entering the ’psi’ area, for it gives a clear impression of the heat to be found in that particular kitchen. One has to admire Braude for having endured it so long with no apparent impairment of his enthusiasm or integrity." "The writing is so fluid that the book at times seems made for a screen adaptation. . . . But Braude also includes some dense philosophical arguments—especially in a chapter about synchronicity, in which he ponders whether humans can orchestrate unlikely coincidences through psychokinesis." "Braude carries the discussion about the nature of consciousness and reality in light of the occurrence of anomalous events into deeper waters than those usually entered. . . . I liked this book." "An incisive, disarmingly frank account of [Braude’s] parapsychological investigations."